A spectacular exploration of sport climbing in Scotland, featuring the top rock activists, including Dave MacLeod, Joanna George, Dave Redpath, John Watson and Niall McNair.Controversial from the start, Chains follows a passionate community of rock climbers on a journey to seek out and subdue Scotland's most demanding routes, achieving their dreams by reaching for the chains that mark the finish line. The film showcases Dave MacLeod - widely regarded as the best all-round climber in the UK - and the mental and physical environment in which he thrives. 'At my absolute limit,' says Dave in the film, 'It's what I'm looking for; it's what's fun. 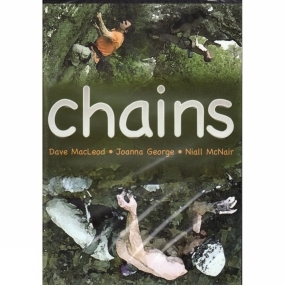 'Chains is the most inspiring Scottish rock climbing action ever seen on a single DVD.